Disgorgement for WRONGDOING - В сложной финансовой ситуации приходит на помощь кредит наличными в Казахстане. What is disgorgement and what are the proper measure of damages when seeking disgorgement? 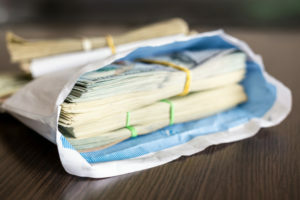 If you have ever asked yourself these questions, the case of Bailey v. St. Louis, 44 Fla.L.Weekly D128a (Fla. 2d DCA 2019), answers both in a bitter dispute with two appeals dealing with awarded damages associated with claims for breach of fiduciary duty, defamation, conspiracy, slander per se, tortious interference, and violation of Florida’s Deceptive and Unfair Trade Practices Act. You name it, this case seemed to include it! Applicable here, however, is the damages associated with disgorgement which is designed to prevent a wrongdoer from profiting from his/her/its own wrongdoing or illicit conduct. Restitution requires full disgorgement of profit by a conscious wrongdoer, not just because of the moral judgment implicit in the rule of this section, but because any lesser liability would provide an inadequate incentive to lawful behavior. If A anticipates (accurately) that unauthorized interference with B’s entitlement may yield profits exceeding any damages B could prove, A has a dangerous incentive to take without asking — since the nonconsensual transaction promises to be more profitable than the forgone negotiation with B. The objective of that part of the law of restitution summarized by the rule of § 3 is to frustrate any such calculation. Id. § 3 cmt. c; see also § 51 cmt. e (“The object of the disgorgement remedy — to eliminate the possibility of profit from conscious wrongdoing — is one of the cornerstones of the law of restitution and unjust enrichment.”). However, the measure of damages for disgorgement is not the profits the appellants might have made absent the wrongdoing — the measure of damages for conscious wrongdoing is the appellees’ “net profit attributable to the underlying wrong.” Restatement (Third) of Restitution and Unjust Enrichment § 51(4); see also Duty Free, 253 So. 3d at 698 (“The equitable remedy of disgorgement is measured by the defendant’s ill-gotten profits or gains rather than the plaintiff’s losses.”). “When the defendant has acted in conscious disregard of the claimant’s rights, the whole of the resulting gain is treated as unjust enrichment, even though the defendant’s gain may exceed” the claimant’s loss.” Restatement (Third) of Restitution and Unjust Enrichment § 3 cmt. c. In fact, disgorgement may be awarded even if the claimant has not sustained any loss. Restatement (Third) of Restitution and Unjust Enrichment § 3, reporter’s note a. (“[I]t is clear not only that there can be restitution of wrongful gain exceeding the plaintiff’s loss, but that there can be restitution of wrongful gain in cases where the plaintiff has suffered an interference with protected interests but no measurable loss whatsoever.”).The trial court’s comments regarding the appellant’s business acumen are misplaced in determining a disgorgement award.